I just got this in the mail today and thought I'd share it with you all. This particulare medal group is named to Spr G.J. Morin. He joined the Sherbrooke Fusilier Regiment on 18 of June 1941. He went with the regiment to Nfld where he served a short detached duty with the 103 Hvy Batt before embarking for Nova scotia with the Sher Fus. At this point they converted to armour and he was temporarily asigned to B Sqad 27 C.A.R. From here his career took a turn. He was transfered out of the Sher Fus to the 4 D.D, then he spent the remainder of the war being shifted between postings including the 27 pion coy RCE, 22 pion coy RCE, 42 intermnat camp, 44 intermnat camp and finally the 4 D.D. Finally he volunteered for service in the Pacific force but was turned down and was finally discharged sept 4 1945. Many thanks to Hugh Crawford for offering this amazing group up for sale, and his impeccable service. Thanks Ed. I was really happy to acquire it. Very nice. I like to see medals connected to Armour. Do you know when he left Sher Fus? Do you have his file or intend to get it? If you want to get an un-redacted file, he needs to be deceased 20 years and you need to prove it. There are two Gerard Morins listed in the Legion Last Post online. One (Gerard J.) was a Chaudière from Chomedy and the other was RCOC from Quebec. Maybe one is you man. I also like the French GS pin. I thought I commented on this already, it appears I was mistaken. I like these simple WWII pairs, as long as there is something to show who they were awarded to, and the numbered pin does just that in regards to the badge. I have 2 such pair, both to soldiers who died here in Canada. One is to Jean Dube (with the Birks Bar) the other to John Barrowman Webster (IrRC) with the Memorial Cross. 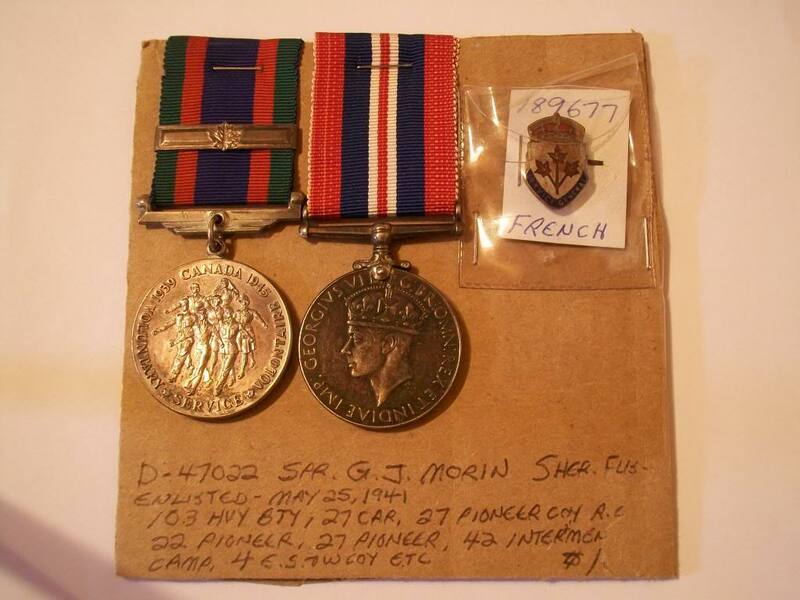 His full name is George Joseph Morin and he served with the Sher Fus between 31st May 1941-14 March 1942. After this he was run through a number of RCE companies as well as a couple of interment camps. When he was discharged he was a SPR in the RCE. I bought the group from Hugh Crawford and got a very basic file on him. Sadly most of the personal details are blacked out. I've already checked the Legion last post and he's not listed, but I would really like to get more on this man. I'll try to scan some of the file and post it, any help or thoughts you guys might have on finding more on G.J Morin would be much appreciated. Happy to help. I see his Regt'l # is from a Sher Fus block. Interesting that his medal entitlement was un-claimed until 1960 and re-issued in 1977. Getting a un censored file at this time will require you to prove his 20+ years of death. With his full name and a region of Quebec to search, you stand a good chance. Yes, Hugh Crawford has a great service but I hate staples!! That original ribbon is getting harder to find. It appears he received a reissue of his General Service Badge as well. Nice to see you have the original issued badge. Would be great to have both. I'm new to the medal game, where should i go from here to find proof of death? i really would like more on this man, although he never went overseas he certainly seemed to get around. If you want to find proof of death assuming the owner has indeed passed on I would start looking on line with the Legion Last Post (you can google this). If unsuccessful there I would back track the medals, like where did you get them? Once you find a location as far back as you can check that city's newspapers obituary section. However after going to all that work I would just send for his file. If LAC knows he has passed and meets the requirements for full release they will send you the complete file other wise it will be redacted. Even so you will learn much about your man's service life. I bought the medals from a Hugh Crawford, and he included a redacted service record with the medals. Sadly about all this tell me is when he joined the regiment and what other units and places he was posted and when. I don't have his enlistment papers and what i do have has a lot of the details blacked out. I've already tried the Legion last post with no luck. Has for checking local abituaries this could be difficult has I would be dealing with a number of different papers in two different languages. Do you think if i contacted LAC they might know if he's already past? Well one of the options I neglected to mention is Regimental histories - a good source of data at times. If you have a redacted service file you have all there is at LAC and as it is redacted that means they have no indication Mr. Morin is no longer with us. 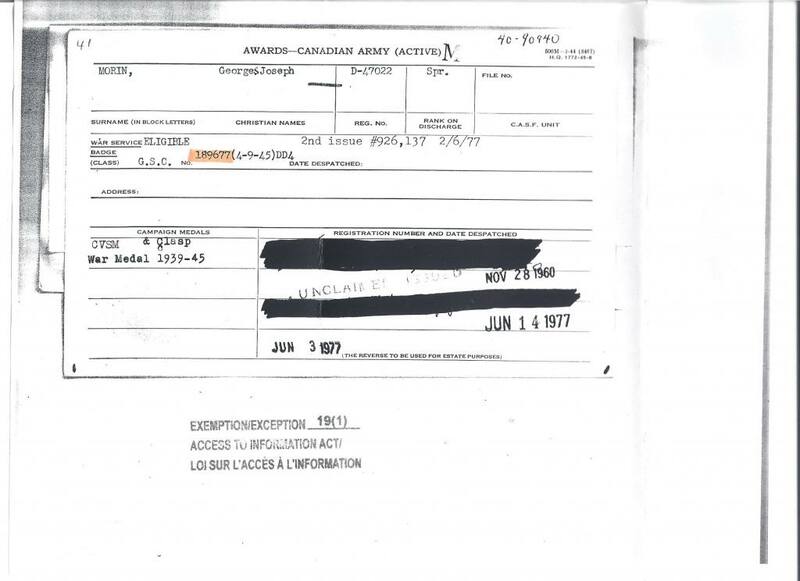 As he enlisted in Sherbrooke it seems likely that is the area he was from and likely where he ended up. 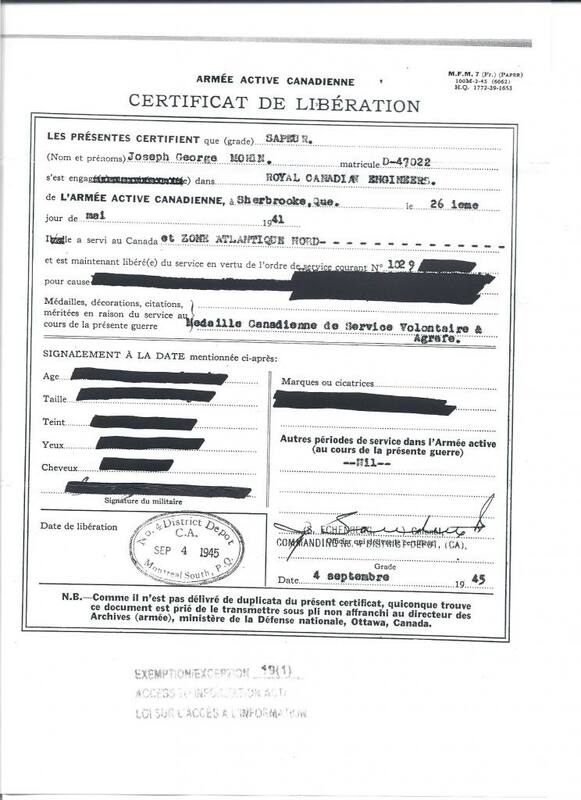 As his enlistment papers are in French the French newspapers is where I would check.